Correa alba with its star shaped flowers is a native to coastal NSW, Victoria, Tasmania and Southern Queensland is ideal for coastal plantings. 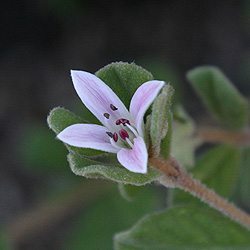 This is a tough little shrub, it takes what we can throw at it and rewards us with its dainty flowers from winter to spring, and good foliage year round. Growing to about 1m, Correa alba forms a nice rounded mound, frost resistant, full sun to part shade and nice blue green foliage. Flowering in winter to spring although this is a dense growing native plant can put out flowers year round. 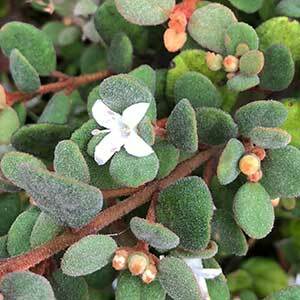 The low growing nature of Correa Alba, along with dense foliage makes it well suited for use as a ground cover plant. C. alba var. pannosa is even lower growing species. Little pruning is required although some gardeners will pinch back new growth to help create a denser habit. Propagation is from cuttings or layering. Use Correa alba as a filler in the garden border, or try planting it as a low hedging plant, it can be pruned to keep it in shape. The lower growing varieties make good ground cover plants. Common Names – The White Correa. Height – To around 1.5 metres. Spread – Will get to around 1.5 metre in width. Soil – Humus rich well drained, however tolerant of sandy soils. Flowers – White, often tinged with lilac. Foliage – Small and rounded mid to deep green with a silvery reverse.